Bridgeport Way is the most heavily used thoroughfare in Pierce County, with 24,100 cars per day in places, and is often used to bypass the local highway. 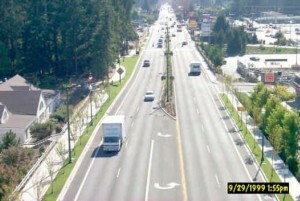 It is located in University Place, a suburban city of about 31,000 people adjacent to Tacoma, Washington. In 1996, the newly incorporated city determined that the street needed to help the local economy and to be made safer, especially for pedestrians, who used two feet wide gravel shoulders in the absence of sidewalks. During a four and a half year period between 1995 and 1998, there were 301 crashes on the street, about a third of which resulted in injuries. During the same period there were 101 vehicular accidents, resulting in 10 pedestrian injuries along a 1 mile stretch of the corridor. The city desired to create a more safe, walkable, and attractive main street town center along 1.5 miles of University Place, and succeeded through the road’s redesign. 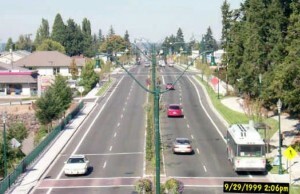 Prior to the redesign, Bridgeport Way had five lanes, including a two-way left turn lane. It lacked pedestrian and bicycle infrastructure of any kind, as well as on-street greenery and directional separation for vehicles. 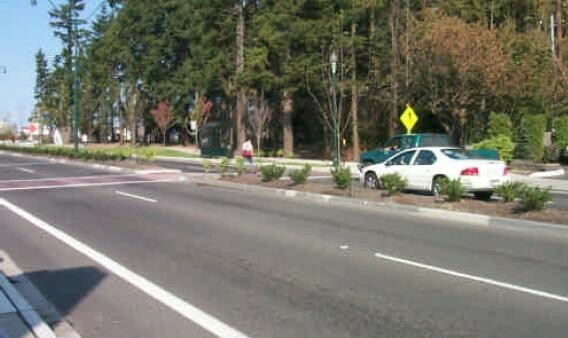 Two-way left turn lane replaced with a landscaped median to calm and beautify the street, minimize head-on accidents, and stop left hand turns across traffic from driveways. U-turn permission signs were placed at signalized intersections without a turn-bay. Bike lanes and wide sidewalks constructed along one mile, separated by planter strips, on both sides of the road. Two new mid-block crosswalks, as well as crosswalks at intersections. Initially, the mid-block crosswalks had embedded flashing lights to warn drivers, but these intersections proved dangerous, so full pedestrian signals were installed in 2002. Utility lines buried and street lighting improved. Flared intersection design used to accommodate wide-turning vehicles. Average speed declined 13%, from 37.6 mph to 32.6 mph, in a 30 mph zone. This contributed to a decline in average annual crashes of 60% from 19 before, to 8 in the first year after the redesign. The mid-block crosswalks have more than 100 pedestrians use them daily, and pedestrian use of the corridor appears to have greatly increased, yet pedestrian accidents have not increased, and remain steady at about 2.5 annually. Sales revenue increased by 7% on the corridor compared to 5% citywide. There was also significant redevelopment and a number of businesses moved to the corridor after the project was completed. Dan Burden, using a process now widely applied through the WALC Institute, was brought into University Place in 1998 in order to support a complete street on Bridgeport Way by addressing the business community and others' strong concerns about the project. A charrette style workshop using “informed consent” was arranged, including a walking audit, and the project was installed a year later. The project initially included roundabouts, but there was mixed public response to a demonstration roundabout, and they were dropped from the final plan. Construction occurred in three phases of a half mile each, between May 1998 and June 2002. The Chamber of Commerce worked with local businesses to convince them that the median island restriction of mid-block left hand turns would be more than compensated for by other improvements. Most businesses donated an average of 10 feet of right-of-way, lowering city acquisition costs from $500,000 to $30,000. The city also cooperated with the local utility company, which agreed to pay half the cost of burying the utilities.